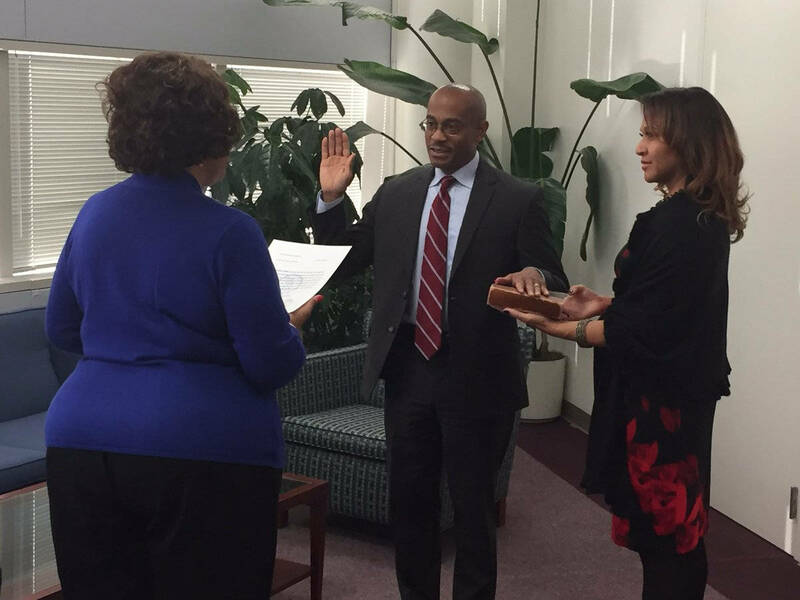 CHARLOTTE, NC (WBTV/Steve Harrison/The Charlotte Observer) – Marcus D. Jones is officially Charlotte’s new city manager, city officials announced Thursday morning. He was sworn in Thursday. “We’re confident in the next city manager and I, as well as the entire team, are ready to support him as we build a stronger and more inclusive Charlotte,” said Deputy City Manager Ron Kimble. The Charlotte City Council agreed to hire Jones as its new manager in October. Jones will be the city’s first African-American manager. His hiring comes at a crucial time for Charlotte, which saw days of civil unrest after the Sept. 20 police shooting of Keith Lamont Scott. The District Attorney’s office announced Wednesday that criminal charges would not be filed against the officer who fatally shot Scott. The City Council and Mayor Jennifer Roberts voted to have an outside consultant, The Police Foundation, review Charlotte-Mecklenburg police procedures. They also have pledged to build more affordable housing and to create a $1 million jobs program. Jones will be tasked with implementing that response. Jones, a Virginia native, grew up in Caroline County, north of Richmond. He is the son of a Baptist minister and has three children, according to a recent profile in the Hampton Roads Business Journal. Jones was the budget director in Norfolk from 2004 to 2007 and then the city’s assistant city manager. He went to Richmond city government before returning to Norfolk in 2011, when he was hired as manager. Norfolk’s population is about 250,000. It’s the second largest city in the Hampton Roads metro area, which has about 1.7 million people. The city’s last hired manager, Ron Carlee, didn’t seek a contract extension this year. Council members interviewed finalists for the job at the Omni hotel uptown on Sept. 20 – the day Scott was shot by police. One night later, on Sept. 21, protests in uptown turned violent when a protester was shot and killed in front of the same hotel. Copyright 2016 WBTV/The Charlotte Observer. All rights reserved.